Even if the word „Piano“ is included in the Deconstructed Piano, this instrument isn t́quite like anything you would expect as a piano. Explore a familiar sound of a piano in a complete new way. Play textures, strikes, hits and sustained sounds including screws. The variations of this piano are exhausted to the limit. Deconstructed Piano: the name explains itself. We have disassembled a piano to its soundboard and have worked on this in many different ways: we have played, hit, stroke and destructed the piano with a wide range of materials. We have used a regular piano hammer, different kinds of mallets such as a felt or a wollen ones, screws, plecs, sticks, thumbs and even straws to coax new inspirational harmonic sounds from the instrument. In order to achieve additional perucussive material, we have captured 24 different percussion sounds (recorded in multi round robin variations) which can be easily mixed to the entire piano sound or just be used separately for experimental purposes. We have also recorded plenty of textures, soundscapes and noises of the piano by scrubbing, hiting or playing the soundboard. While disassembling the piano we have recorded all that noises of destruction done with a sledgehammer and put this into an extra patch as well as in a special categorie inside the textures patch. 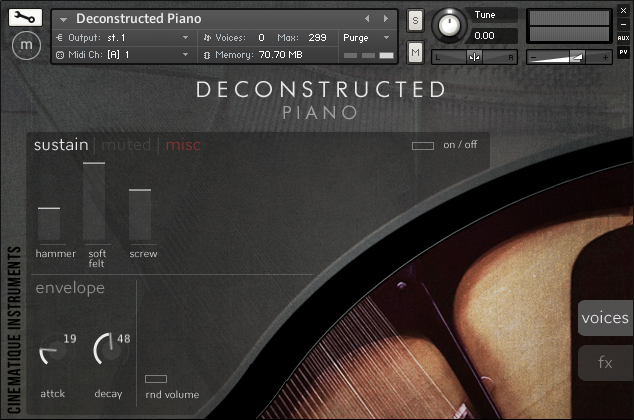 Deconstructed piano is a great collection of sounds, noises and textures exclusively created with a piano. It totally convinces with its diversity. No matter if you are using the powerful short hit from a metal bar, using the gentle screw piano sounds to give your music a subtile highlight or using the massive strike sounds to create great impacts, the Deconstructed Piano adds a new color to your sound. 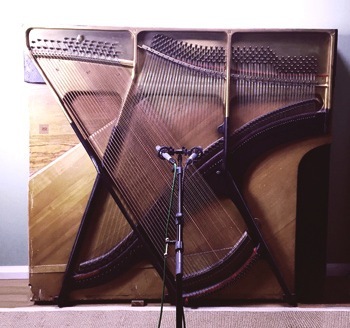 The piano patch is the basic instrument. It delivers three different sound categories with eleven piano sounds in total. By dragging, you can control the volume of each sound. It gives you the possibility to combine and create your own instrument setting. Besides an attack and decay slider, the instrument provides a button that randomizes the volume of each of the 11 sounds which results into new sound combinations. The patch also includes an FX section in which you are able to choose reverb, delay, distortion and an EQ. Finally we have collected plenty of soundscapes. This patch is a very useful tool to create evoloving textures with tension. Beside the above mentioned sound options of EQ, reverb, attack, decay, distortuion, this patch provides and automatic volume variation with speed control as well as an „hold“ button for an infnite sound. Three complex patch including four many different types and stlyles of piano sounds. Approx. data 0.5 GB compressed audio files. For more details please read the . reference manual. It shows a walk through the Deconstructed Piano in.